The first industrially produced air-conditioning plant to combine all four functions of heating, cooling, humidifying and dehumidifying was constructed by Dr. Willis Carrier for a printer's shop in New York. The object was to maintain the air humidity - vital for the printing process - at a constant rate regard- less of the outside air temperature. This requirement was also the original challenge for our company and the starting signal for over 5 decades of successful work in the field of air-conditioning and ventilation. 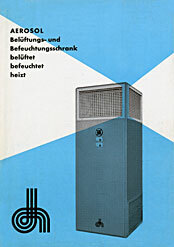 In the beginning there is an apparatus: The Aerosol air humidifier is our corner stone in the air conditioning sector. A great deal of effort and meticulous experiments are invested in the Aerosol before it is ready to be take up its work at the beginn- ing of the fifties, primarily in the printing industry. In its early phase Daldrop + Dr.Ing.Huber demonstrates ingenuity in the design of equipment. A corrosion test chamber is developed and constructed, followed by ventilation and humidification cupboards. The basic design feat- ure of the units is a patented light alloy profile frame with a screw- ed on corner joint. The housing covers differ considerably from the conventional design. They are made of multi-layer laminated plat- es, which are extremely robust and at the same time exceptionally hard-wearing. Valuable competence and know-how in air-conditioning was thus gradually accumulated. The design and construction of complete air-conditioning plants become increasingly important for the company. The product portfolio is enlarged by adding a production facility for galvanized steel air ducts and an electrical workshop for the construction of control cabinets. Made-to-measure air conditioning plants from Daldrop + Dr.Ing. Huber prove successful in all kinds of facilities: office buildings, industrial plants, hospitals and schools. Air-conditioning plants for the operating theatres of the ear, nose and throat hospital in Homburg/Saar (pic) are constructed. Foundation of the first Daldrop + Dr.Ing.Huber branch in Saarbruecken. An air conditioning plant is installed in the Sheraton Hotel (pic) in Munich in time for the Olympic Games. This leads to a new branch in Munich. Daldrop + Dr.Ing.Huber carries out over 30 major projects in succ- ession for BAYERISCHE HAUSBAU. Our enterprise gains the confidence of leading industrial clients and many other important partners. Challenging, large-scale projects have been in the best hands with Daldrop + Dr.Ing.Huber ever since. This is acknowledged by our industrial partners, such as e.g. AKZO, ANT, Blaupunkt, BMW, Bosch, Fichtel & Sachs, ITT, Mercedes Benz, Hewlett-Packard, IBM and Temic who continually entrust us with new orders. Large-scale projects in Saudi Arabia with their demanding techni- cal and logistic challenges are mastered by us successfully. The many and varied tasks include constructing A/C-plants for gov- ernment buildings (pic: ministry of finance), mosques, schools and living quarters. As availability on location is important, we found a daughter company - Saudi Daldrop Co. Ltd. - in Riyadh in 1980. The rising challenges from industry at the beginning of the eight- ies are the pacemaker for air-conditioning technology. Increasingly sophisticated production procedures pave the way for cleanroom engineering. The first Daldrop + Dr.Ing.Huber cleanroom ceiling "Euro Clean" is developed. The early engagement of our company in cleanroom technology at this time is a trend-setting development and the start of a new and successful era. The first cleanroom project is completed for Telefunken in Heilbronn in 1983. We develop the "Cleanpart" cleanroom wall, skirt constructions as well as air showers, material pass-thrus, sit-overs and lockers as part of the overall cleanroom system. "Euro Clean" is developed further and the ceiling system P 65 ev- olves which is used in the microelectronics field with great succ- ess. In the field of Life Science an operating theatre with patented venti- lation system is developed. Hospiclean is an operating room in panel construction which sets new benchmarks in quality and functioning. First plants for the production of medicines are executed. The EPO production line is constructed for Boehringer in Mannheim. Projects for the company Human Pharma lead to the foundation of Hungary Daldrop KFT. in Budapest. For IBM in Böblingen-Hulb a pioneering achievement succeeds: the large-scale implementation of cleanroom class 0.1 over the whole production line. In recognition of Daldrop + Dr.Ing.Huber´s performance in conn- ection with the start of the first European 4-mega-bit-chip produc- tion is officially distinguished for its achievements on 03.07.1989. For the erection of a new cleanroom building for the engineering science faculty at Ulm University (picture) we develop the VARIPRO system. This pressure plenum system, which is implemented for the first time here, sets a further standard. This is a flexible system with high adaptability to cleanrooms of various classes. Our European network is extended with the founding of Daldrop Technik s.r.o. in Liberec, in the Czech Republic. Making use of synergy to the client´s advantage: Daldrop Surface Technology is founded and specialised in the construction of complex plants of surface treatment. The company is later integrated into the parent company as self-contained department in order to make better use of synergy. The new GMP production hall for biotech products in Riems (picture) is completed. Daldrop + Dr.Ing.Huber is the general contractor for this project, responsible for planning and design. 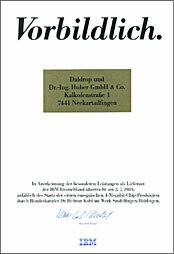 Founding of Daldrop Service GmbH. This independent company subsidiary is responsible for maintenance and process measuring and control technology. The specific demands of the complicated production processes in the world of pharmaceuticals give us the incentive to adapt our high-quality wall and ceiling systems of the VARIPRO series. For the vaccine Plant IDT in Dessau (picture) we develop the P 80. This is a walk-on linear grid ceiling, which in particular takes into consideration the installation of components for the building services suitable for the pharmaceutical industry. Sophisticated projects in Israel lead to the foundation of Daldrop Israel Ltd. in Haifa. For clients requiring unconventional systems to be set up and operated in remote corners of the world, Daldrop + Dr.Ing.Huber is the right partner. The cleanroom for the European Southern Observatory (ESO) on the peak of "Cerro Paranal" - a 2600 m high mountain in Chile - is the room where the telescope mirrors are cleaned and coated. The cleanroom ceiling in the cleansing area is constructed of purely synthetic materials. A new generation of the VARIPRO FAN FILTER UNITS (FFUs) with EC drive is developed. Its concept also comprises communication software for flexible line operation and data recording. 3600 FFUs are supplied and fitted for IBM in Ireland (picture) for just one project. Foundation of Daldrop Ireland Ltd. Demanding projects at home and abroad, e.g. for Sartorius in Göttingen, Aventis in Frankfurt-Hoechst or for Applied Materials in Israel, requires our production capacity to be extended. A new production building is erected in Alleenstrasse in Neckartailfingen (picture). Schering-Plough, a pharmaceutical company engaged in the research, development and production of medicines worldwide, erects a new biotechnological production facility in Singapore. Daldrop + Dr.Ing.Huber is the design-and-build partner for a scope of work for which we create the term SHELMEQ®. Foundation of the Daldrop Singapore Pte. Ltd. The trend in cleanroom walls is for a higher percentage of glass surfaces. Our client´s request to provide pharmaceutical walls made almost entirely of glass for the Bayer works in Bitterfeld is an initial challenge for us. The newly developed pharmaceutical sliding door VARIGO is installed here on a large scale. Innovatives Planen (IP), engineering consultants, becomes a company subsidiary of Daldrop + Dr.Ing.Huber. IP engineers are experts in building services with specialist knowledge in production facilities with cleanroom requirements. Wyeth, one of the leading companies worldwide in the field of prescription drugs and health products, forms an Alliance EPCM Service Agreement with Daldrop + Dr.Ing.Huber. The PH 120 pharma ceiling is developed for those projects placing high demands on planning freedom in the interstitial space. P.R.Corp. is founded in Puerto Rico and in Guayama our company builds cleanrooms up to a height of 14 m for Wyeth. For Hoffmann-La Roche in Basel plans can only be designed with little room available in the interstitial space due to building restraints. Daldrop + Dr.Ing.Huber is able to fulfil customer demands regarding flexibility and maintenance with the cleanroom ceiling PH 60 which is newly developed for this project. For the renowned contract manufacturer hameln pharma Daldrop + Dr. Ing.Huber builds in the joint venture PHARMABAU a new production building. At the highest stage a cleanroom area of 4000 m² is realized here. In July Sandoz opened the extension of their Aeropharm production facility in Rudolstadt. Daldrop planned and installed a total of 2000 m² of cleanrooms for this. Four high tech lines for pharmaceutical aerosols have been installed in the buildings. The BAbs - Pfizer's biotechnology facility in Ireland is built within just one year and receives the "Facility of the Year Award 2010". In 3000 m² of cleanroom Daldrop + Dr.Ing.Huber finds innovative solutions for improved safety, such as the new development of sliding doors with indicator lights in the wall protection posts.